Join us on opening night as a special guest of Oakland Trails! Presented by Oakland Trails in association with Pinecone Pictures, our new 22-minute documentary highlights “Old Survivor”, the last known remaining old-growth redwood in the East Bay hills, and tells the story of Oakland’s resilient, ecologically amazing, and now protected redwood forest. This free event will feature multiple screenings, guest speakers, and a reception outside the theater doors where you’ll be able to mingle with the filmmakers, partnering nonprofits, and our many supporters. Refreshments will be served from 6pm–9pm. The World Premiere of Old Survivor will simultaneously serve as Save the Redwood League’s Centennial Celebration in Oakland. 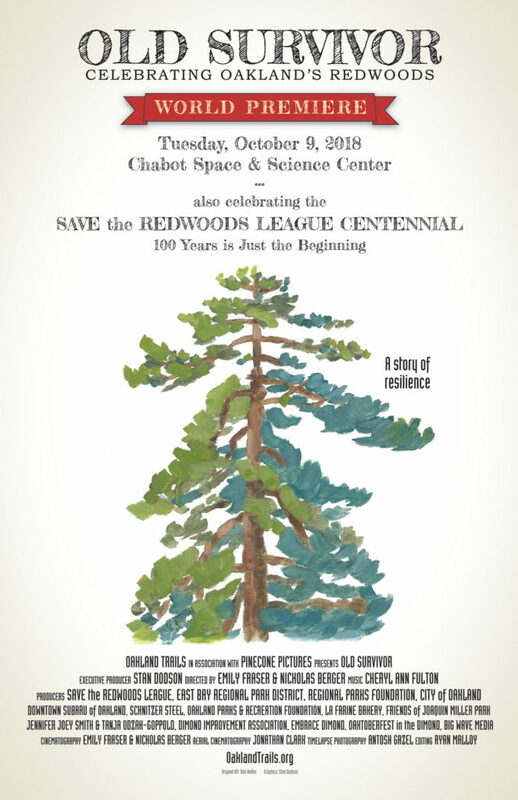 Join us as we recognize the 100th anniversary of Save the Redwoods League and celebrate their conservation legacy to protect California’s incredible coast redwood and giant sequoia forests in the last century.